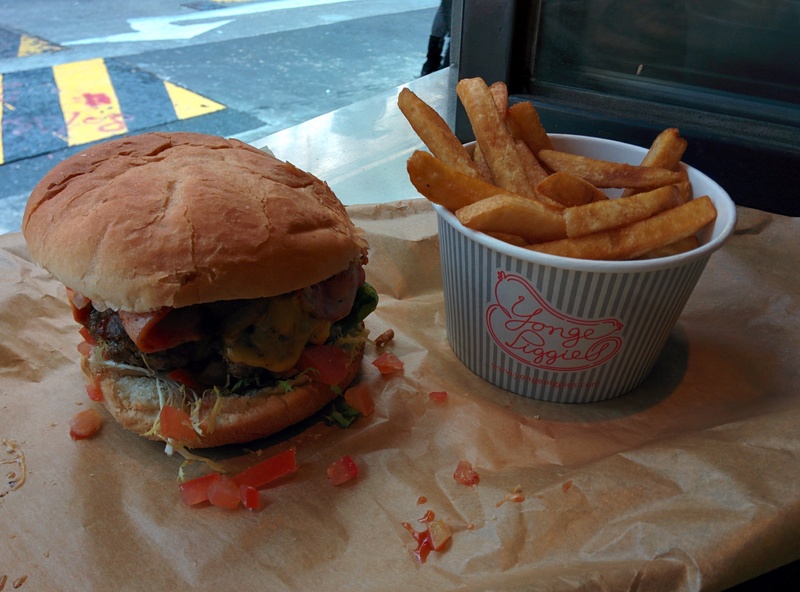 Yonge Piggies’ Angus Beef Burger is an exquisite hamburger. A place notable for their dogs more than anything – Yonge piggies has decided to enter the burger arena; their ingress, a burger whose origins stem from the hot dog universe, is one, that while not the most boisterous, carries a robust burger taste balance that has great proportional ratios and provides the inspiration the satisfaction one needs to feel burger fulfilled. The well rounded beef patty, with a sturdy texture that compels to each bite, has a muscly beef taste that is peppered with a burgeoning pepper seasoning that tingles with a slight spiced touch. More excitingly though is the would be chance of experiencing the unintentional splash of flavors from the dogs and chili that may be cooked in the immediate vicinity. That one meaty juicy bite, a lucky chance of a bite that treats two magnificent flavors into a burger to be enjoyed between one’s cheeks, is a joyful experience that is unfortunately not guaranteed across every burger, or even the expanse of a single hamburger. Raised amongst the dogs, this burger goes through a similar process of fruition – one orders meat and bun, and can add a simple gooey cheese and a flimsily chewy but tasty bacon, and proceeds to a selection of condiments that range from raw greens and prepared foodstuff, to zesty relishes and rich sauces. Each additional item placed on the lower half of the naked bun that supports the patty strengthens the burger taste balance; yet, some ingredients designed to be held within a single bun piece adversely affect the burger’s integrity as they depart away into the distance – having to scrounge for remnants of tomato and onion to re-stuff the hamburger is not burger ideal. The bun notions a wholesomeness taste that doesn’t come across its build. Inside the basic selection of chopped vegetables is quite rudimentary. The burger taste balance is lifted more so by the savory cooked onion and mushrooms that add a grand hint, and the southwest sauce that works to complement the existing pepper feel in the burger to create a pleasing picante semblance. The fries are good. For 82.00 HKD this is a burger that one should try, and adding a slice of cheese and a strip of bacon for 6.00 HKD each isn’t too distressing. In the house of piggies, the cow has made a strong place for itself at the table. 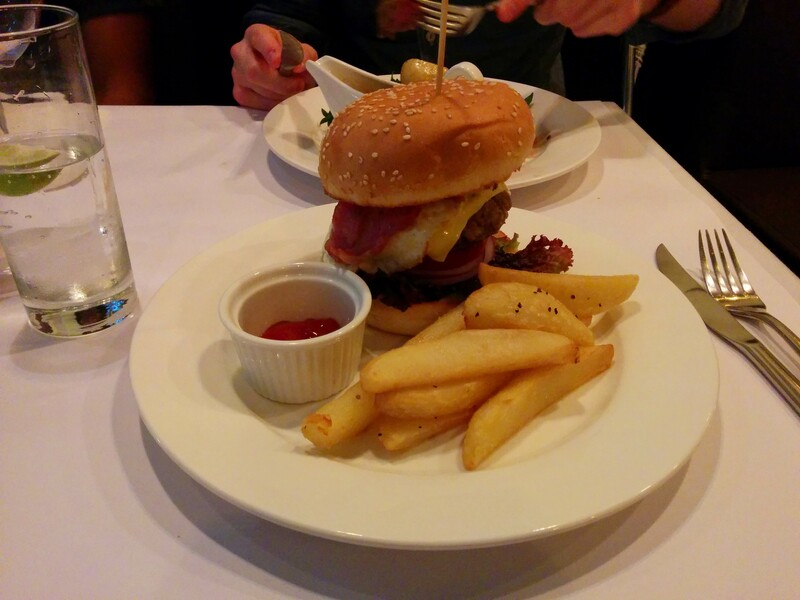 Tango’s Homemade Beef Burger is an exquisite Argentinean hamburger. The inarticulate plainness of the hamburger and the top elevation of the bun may cause the burger to be greeted with a sense of confoundment; upon the first bites it won’t take long to realize that the burger performs a beautiful tango piece as it’s embraced and partnered with one’s mouth, a playful flavor twirl that occurs as it touches the tongue, though not entirely flawless and with a couple of missteps, a twirl that demonstrates a rich burger taste balance that passionately dances into the stomach. The beef patty, a precise measurement to the bun that some how seems to clasp its partners, clearly leads the burger taste balance in a star performance. In it there is an exquisite beef relish, a meaty Argentinean beef steak patty that has all the due bragging rights. Rich, juicy, thick and with a colorful pink brownness its only slip is its soft delicate texture that causes an outward spread that for an instant seems as to escape beyond the bun… It doesn’t; and even though the center might thin slightly, every bite is with both meat and bun. Still, the way the burger has been constructed does leave one’s burger fulfillment slightly unfulfilled, its not so much the composition of some of the ingredients but that some of the ingredients, particularly the bun, feel slightly colder than one would like them to be – perhaps a cold stone plate isn’t befitting. The patty’s tasteful appearance and stumbling build is contrasted by the white bread, a bun that looks corpulent but compresses without breaking – it carries the hamburger to a graceful burger taste balance. The provolone cheese, a well fitted gown to the burger, adds a subtle cheesy savor flow to the ensemble; and the vegetables, fresh and crisp lettuce and tomato and piquant sliced red onion, all finely chopped for the betterment of their participation are proportioned as to indicate that most of the attention should be placed on the meat. Chimichurri, a delicious green sauce made with herbs, garlic and oil, has been harmoniously combined with mayonnaise for a much richer tang that elevates the overall burger experience. The fries are good though a bit garlicky. 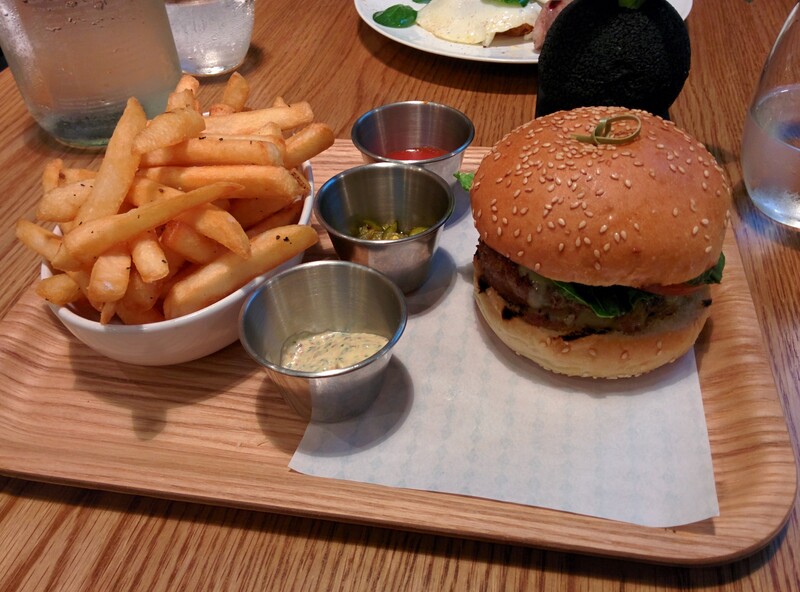 For 138.00 HKD this is definitely a burger dance once should go and try. The cost not only includes a side but also a starter, the choice of a wonderful beef empanada means that one is able to enjoy a genuine Argentinian style ‘burger’ before the arrival of this exquisite hamburger. The name is unbefitting though, the burger should be proud of its Argentinean roots. Beef & Liberty’s classic special is an exquisite hamburger. A burger that has been cherished, and well groomed to be one of Hong Kong’s elite hamburgers; the care given to this burger radiates within one of its ringleaders, Neil Tomes – the proud executive chef who passionately articulates his burger and ingredients, who has remained vigilant tending to create a burger that has attained a certain burger beauty. Far from its beginnings as a decent hamburger, with a new array of notably sourced ingredients, this burger lives on with a worthy burger taste balance – one that’ll have four men guzzling a burger within moments of its arrival. 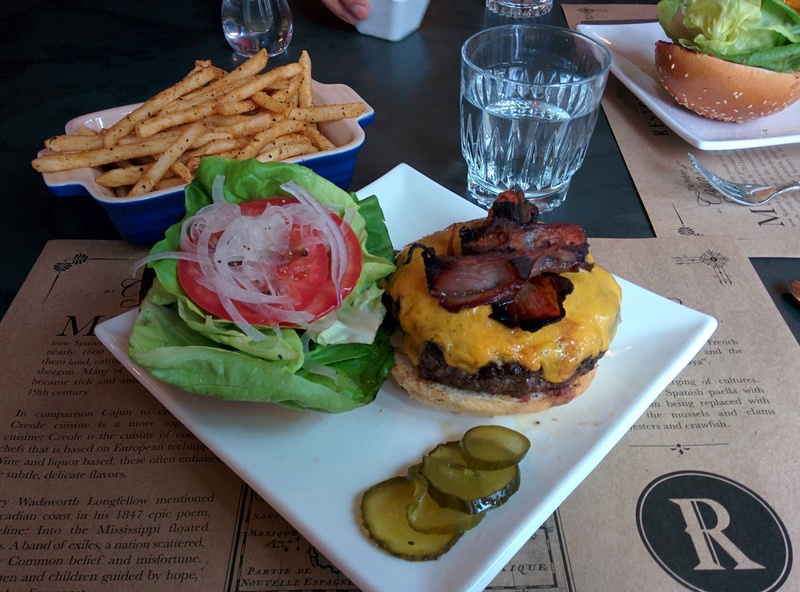 Since my first visit, which you can read about < here >, this burger has experienced a couple of changes – in both its soul and character. 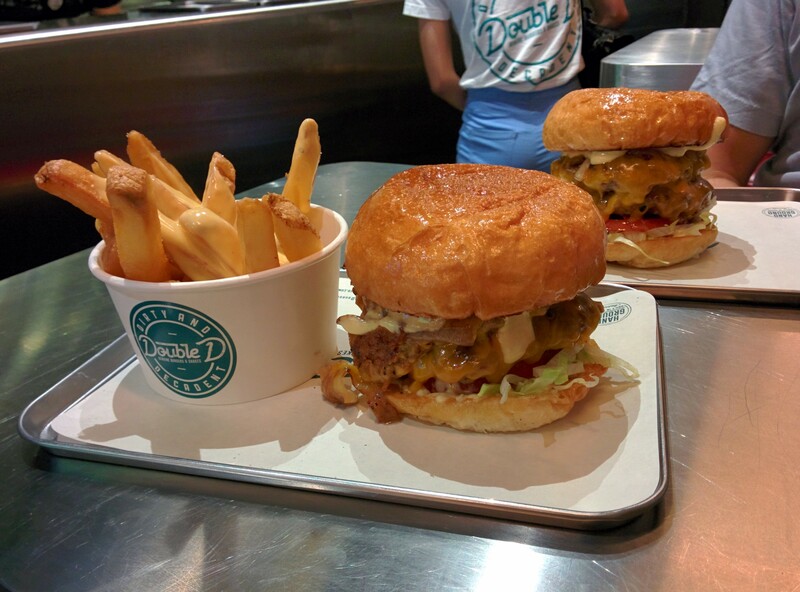 Key aspects such as the patty and bun have remained unchanged and improved for the better. The beef continues to perform as a strong companion – utterly exquisite it is lean and juicy, and with a great mellow texture. And the bun, still with its soft core and crisp exterior, holds the burger together in a pliant compression that, at times, may make the bun a bit too thin. It’s everything else surrounding these two components that has been revamped – and the new ingredients are great, they make the bun and patty taste even better than before, and they give new meaning to this burger’s burger taste balance. Just as before, the grass fed cattle was sacrificed with all the right intentions, but now, it shall be accompanied by a small friend – the bacon. The very tasty thick cut bacon is firm and crisp, with a ripe tenderness and quantity, it is pleasantly felt throughout each bite. The soft tenacious mantle of cheese is savory, a bit overwhelming at times, but generally great. The greenery provides fresh crunchy palpitations, lettuce and tomato both satisfy, but the onion accentuates the burger with a sweet touch. If there’s one underachiever in this burger, it’s the bacon jam, in small quantities it can certainly add an agreeable zestiness to the burger, however, too much and it can deluge the whole burger with an overtly sweetened tang; I would much rather have the cajun aioli as a condiment, a rich mayo that adds a hint of piquantness. 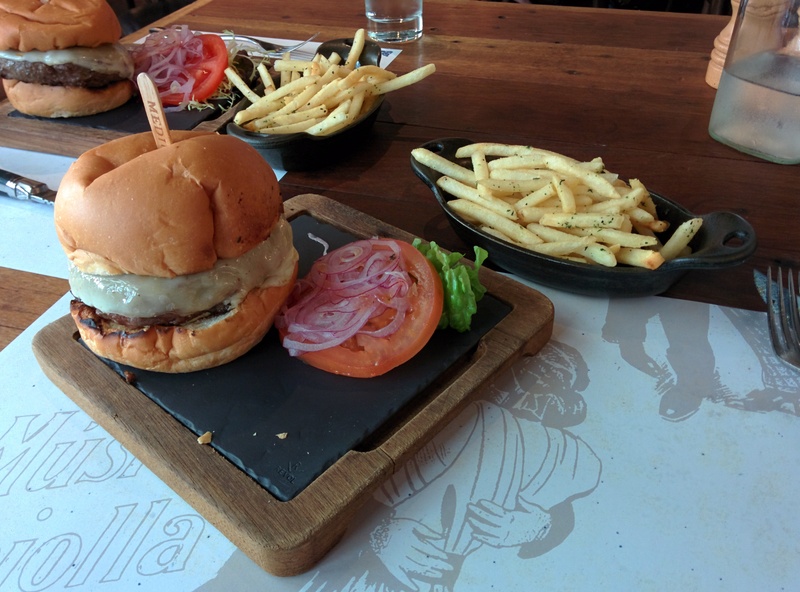 The burger’s build, which starts of with a blissful presentation, is staunch; its great compression comes with great constructability, and throughout each bite the hamburger holds its shape. Though there are times that the proportional ratios might be a bit off – with one bite of bread without beef too many. The french fries are good. This hamburger has done a wonderful job in delivering a great burger taste balance, and care has gone into the whole lot of ingredients. 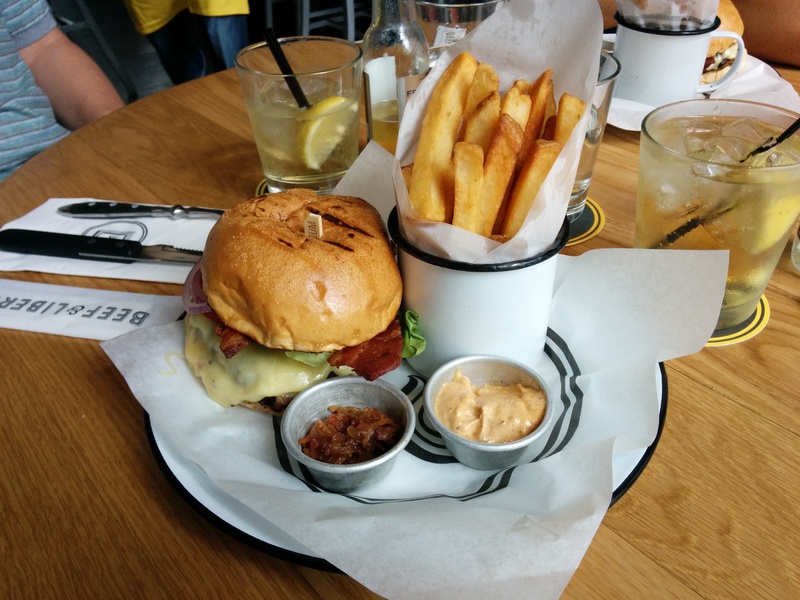 At 118.00 HKD, 148.00 HKD including fries and a drink, there are few places around handing out a burger experience as good as Beef & Liberty’s. Restoration’s simple burger is an exquisite hamburger. 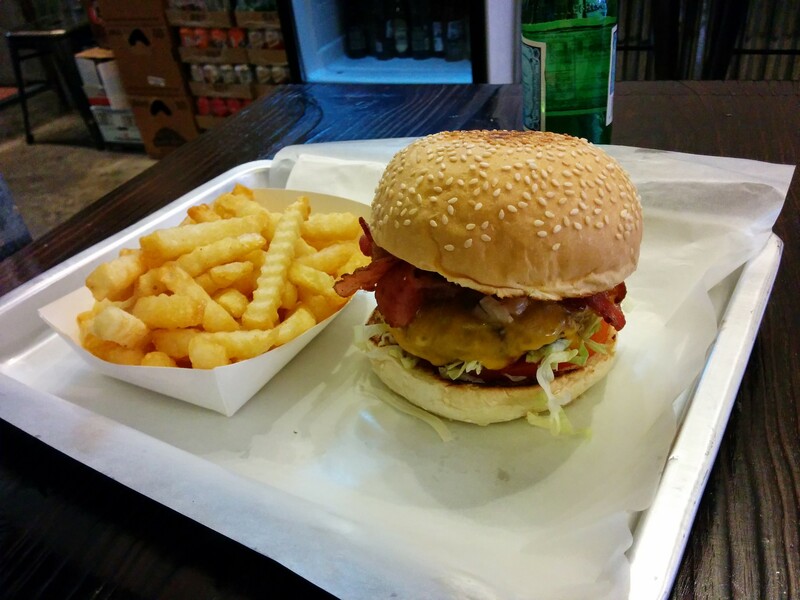 It is a gorgeous southern belle in the center of Hong Kong; the hamburger, vivacious in both appearance and taste, makes a grand entrance, charming your senses as it releases a waft of its delightful burger perfume into your nostrils – preparing your body for what should be a beautiful burger experience. What follows moments after that whirl, from the instant you envelop this hamburger, is a rich and tasty burger taste balance rush; and the realization that prudence has gone into the ingredients as well as the construction – resulting in mouthfuls of exquisite burgerness. Often encountered in Creole cuisine, one might notice that black pepper has a well distinguished role in this burger, a role that achieves a welcoming kick of southern spice; furthermore, the beef patty, full of flavorful meat juices, accomplishes a neat beef taste that is subtly accentuated by the apt peppery seasoning. Although the texture of the patty might feel slightly coarse at times, the patty is offered with the right thickness and correct diameter – creating a near perfect ensemble with the bun and other ingredients. The melted cheddar cheese, which clings to the patty with a thick radiant summery yellow, properly manages to softly gleam throughout the burger experience; the vegetables, finely tuned to the portions of the burger, establish an evident sense of freshness and, particularly the tomato, natural taste. 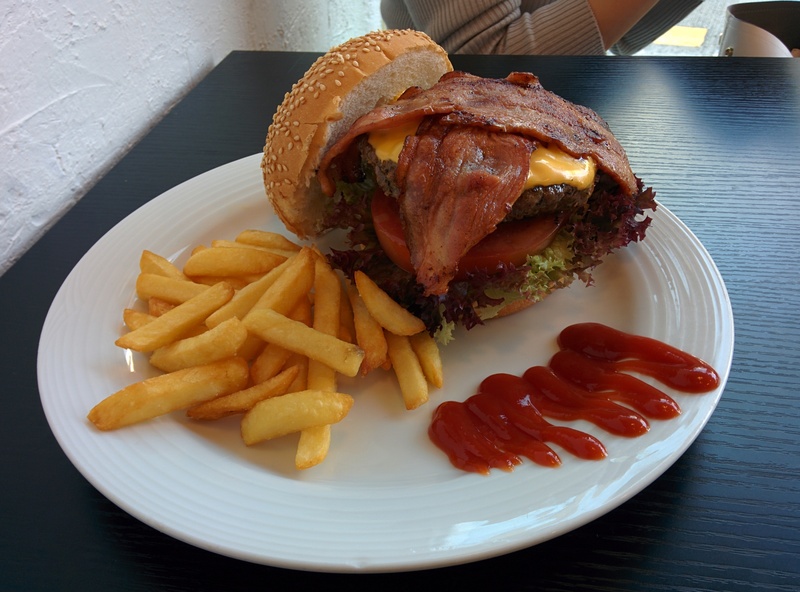 The bacon does leave something to be desired for, not because of its slightly charred appearance – which surprisingly doesn’t have a blackened taste, but more so because of its heavy saltiness that can disturb the burger. 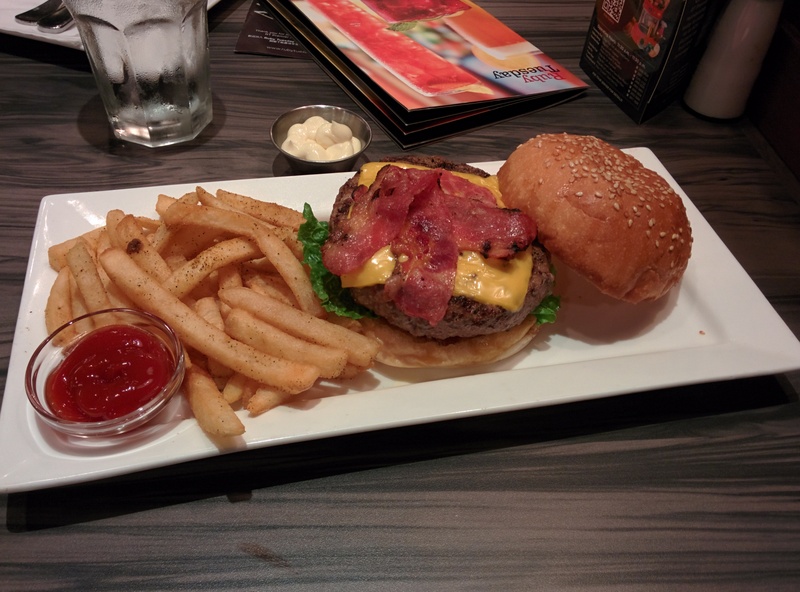 Though I have to mention, the bacon is not included in the burger. The tasty toasted bun, spring and soft, appropriately adjusts to the inner workings and assemblage of the burger, absorbing the juicy remnants while keeping the burger tightly held under its arms – it gives a feeling of satisfaction as you hold this solid burger. The piquantly seasoned fries are great. 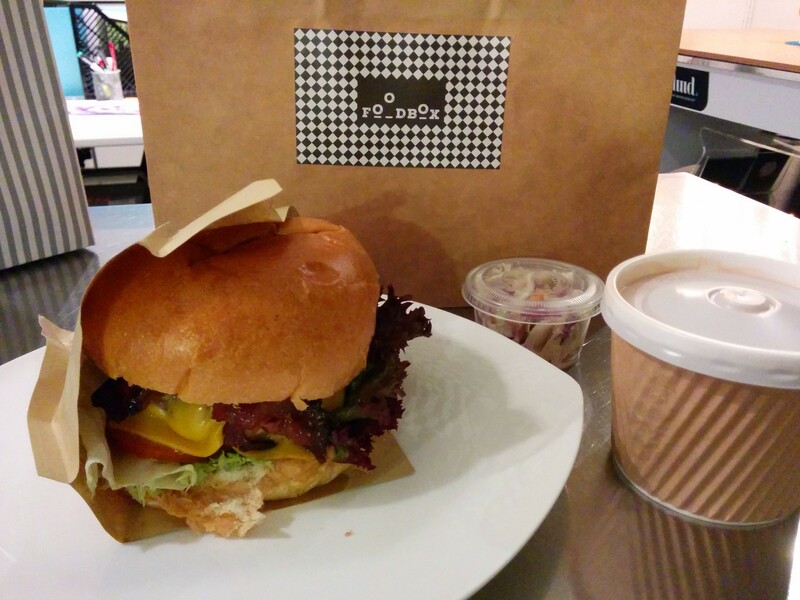 Served only during lunch, for 108.00 HKD this burger is definitely worth a try. As part of a set lunch it’ll come with a choice of soup or salad, and four cheese options for its cheesy topping. However, it is unfortunate that the presence of fries, though good and plentiful, comes at an additional cost of 25.00 HKD. One last thought, I really hope that Restoration preserves the consistency of this exquisite burger, as one of the best burgers in Central – i’m sure Louisiana detectives Rust and Martin would approve, laissez les bon burger temps rouler!